In her time away from the clinic Dr. Kris enjoys quilting, SCUBA diving, gardening, traveling and being a “mama”. Her best friends include Zipper a three pound Yorkie, Pretzel a French bulldog, Sadie an old black lab, Vera the “wild” Pug and Mark a plumber and Farmington Volunteer Firefighter. Alex her adopted Russian son is Dr. Kris’s newest addition. She is enjoying being a parent. Hello! My name is Dr. Amy Lorenz. I have been practicing veterinary medicine for almost 12 years. I received both my Bachelor’s degree in Animal Science and my DVM degree from the University of Minnesota. 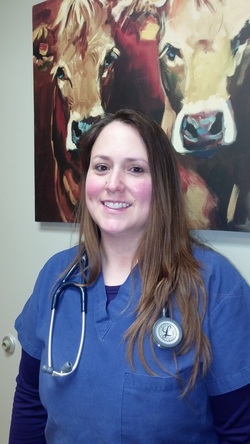 I have been with the Farmington Vet Clinic since August of 2008. Before coming to Farmington, I had worked in clinics in Winona, Hastings and Hutchinson. I am originally from southwest Minnesota. I currently live near Hastings with my husband and two daughters. I currently have a one-eyed elkhound/husky cross, a three-legged Queensland Blue Heeler and 4 very old cats. My interests are in small animal internal medicine, infectious diseases and rescue work. I am also a certified State Humane Agent with the MN Federated Humane Societies and am a member of the board. I am a member of the AVMA and the MVMA. If I ever get a spare moment, I enjoy being on the motorcycle, going to the theater, attending charity fundraisers and being involved in my church. I am a 1988 graduate of Iowa State University College of Veterinary Medicine. After graduation, I followed my husband to Kansas City and worked in a small animal clinic there. In 1995, we moved to Mankato for two years, then to the Twin Cities. 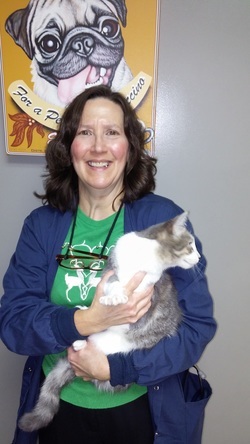 I worked at several clinics in the area before coming to Farmington Veterinary Clinic in June, 2014. I love working part time because it allows me to be involved in other activities like choir and golf league, and some volunteer opportunities. My husband and I enjoy traveling, in the summer we golf, bike and hike, and in the winter we ski and snowmobile.